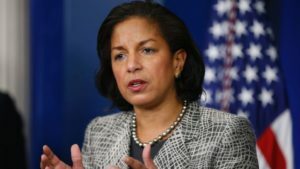 National Security Advisor Susan Rice scolded Israel while at the same time pledging a record U.S. military aid package to the Jewish state. The Obama White House is at odds with U.S. public opinion, reflected in Congressional actions, that strongly supports Israel despite a regional envirnoment including much of Europe that is increasingly critical of the Jewish state. In the same address, Rice lashed out at Israel’s settlement activity, saying that the only road to “sustainable security for Israel and to dignity and self-determination for the Palestinians is two states for two peoples. Currently, Israel receives $3.1 billion a year – almost 53 percent of the $5.9 billion in official foreign military aid handed out by Washington. Following last summer’s nuclear deal with Iran – which Israeli Prime Minister Benjamin Netanyahu vehemently opposed – the Obama administration offered to boost the amount of military aid to Israel to $4.5 billion a year. Meanwhile, Netanyahu and Russian President Vladimir Putin met at the Kremlin on June 7 a day after Moscow called for the renewal of Israeli-Palestinian talks. “It is important to get the Israeli-Palestinian settlement [peace] process going,” Russian Foreign Minister Sergei Lavrov said on June 6. Netanyahu said that “we certainly feel at home. Israel’s doors are open to Russia and Russia’s doors are open to Israel. “We are marking 25 years since the resumption of relations between us, and not only in culture and technology, but in so many other fields as well. There is also a human bridge of over one million Russian-speakers who are our bone and our flesh, but who also come as goodwill ambassadors of a deep sympathy, Israeli citizens who emigrated from the former USSR. “Those who were born and raised in the country absorbed much Russian culture and music,” Netanyahu said.